UPDATE: We want to extend a giant thank you to everyone who contributed to the success of our Harvey Relief Drive. We received an outpouring of love and supplies from across the country and have been blown away by the generosity and strength of pet lovers united by the same cause. St. Hubert’s will be putting all of our donations to use in the coming weeks as they continue to rescue animals affected by Harvey and Irma. Want to keep giving? We’re also working with these organizations that are in need of ongoing help. 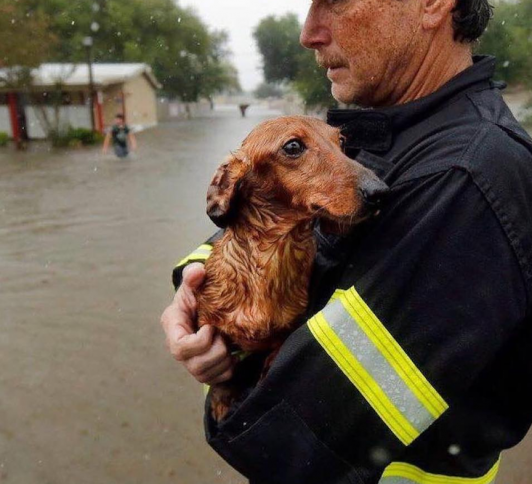 We are heartbroken by the ongoing disaster in Houston and are sending love to the people and animals affected by this catastrophic storm. As displaced Texas animals make their way to new states and shelters, we stand behind the organizations that are helping them heal and find new homes. This is why we’re supporting St. Hubert’s Animal Welfare Center, the New Jersey-based organization that mobilized to welcome 78 shelter dogs from Texas this week. As with any sentient being, being displaced can cause many issues in dogs ranging from anxiety to a loss of appetite, which can lead to future health issues. That’s why we’re donating our nourishing, fresh meals to rescued dogs in need. Food is only half the battle. Caring for a new batch of confused shelter dogs also requires a lot of love, patience, and supplies. This week, we’re hosting The Farmer’s Dog Harvey Relief Drive to help St. Hubert’s. Simply browse our list of suggested items, ship your donation to us, and we’ll bring everything directly to St. Hubert’s next weekend and meet the dogs we’re helping together. Products that can help make a difference range between $5 and $30. We know you love dogs as much as we do; let’s work together to keep them healthy, happy, and safe. Questions about getting involved? Reach out at digest@thefarmersdog.com. Get health and wellness tips about your dog delivered to your inbox. What Kind of Dog Food Are You? Why Do Some Dogs Eat Their Own Poop? The Farmer’s Dog is the leading direct-to-consumer, fresh pet food company, offering customers and their pets the highest quality and convenience without retail markups. All human-grade meal plans are made to order, designed by veterinarians, and personalized to provide the ideal nutritional balance for every dog. Get started today at https://www.thefarmersdog.com/.